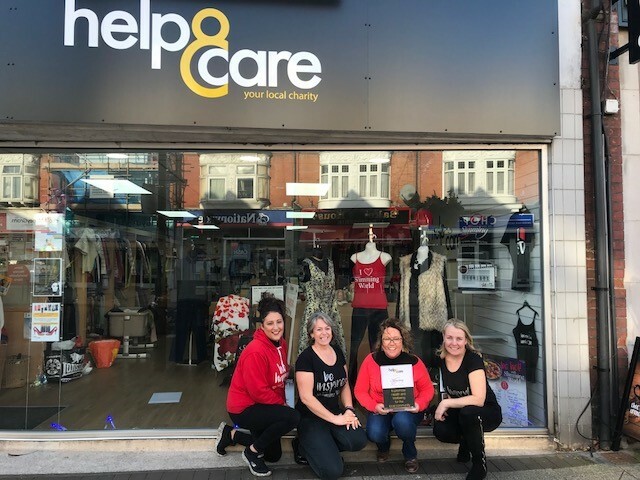 Help & Care’s charity shop in Southbourne, Bournemouth, is working with Slimming World to promote health and wellbeing for the local community and encourage members to donate those clothes that do not fit anymore. Slimming World is the national weight loss company that provides lifestyle and weight management programmes. Kirstie Clowsley, Slimming World Consultant in the Boscombe East and Pokesdown areas, came up with the idea of working with a local charity to gain visibility at a decisive time of the year when so many new members decide to start their personal health and weight loss journey. The latest government figures reveal that 1 in 4 adults in Dorset are overweight. Weight issues can cause a number of further problems that affect people’s quality of life, including health conditions, such as diabetes and heart disease, and psychological problems, such as depression and low self-esteem. On Sunday 7th January 2018, the shop’s window started displaying its first Slimming World success story, featuring Kirstie Clowsley who used to be a member of the slimming club prior to her role as Slimming World Consultant. Throughout the following months the shop will showcase other local members’ stories with the aim to inspire more people to start their personal health and weight loss journey in a supportive understanding environment. In addition, members will be encouraged to donate their clothes that no longer fit to the Help & Care Charity Shop in Southbourne. Find out more about our charity shop.